If y’all love southern soul food, then you will love our Alabama southern style, pit fired Bar B Que. Ask for it “Bama Style,” and you will get a taste of what makes our BBQ unique for Denver! Our meats are smoked fresh daily in house, cooked low and slow with seasoned fruit wood for a melt in your mouth experience. Moe’s Original BBQ uses choice ingredients in all of our, made from scratch, southern side dishes, sauces and rubs for an “all things southern” BBQ experience. Ask about our special, seasonal side dishes! Our pit masters in Denver and Englewood make an assortment of special southern side dishes every day. Follow us on Twitter and Facebook to see our daily specials and seasonal sides. Have us cater your company or private event and we’ll bring you the best BBQ in Denver. Our catering services manager can arrange to have food delivered or have our food truck cater your special event! 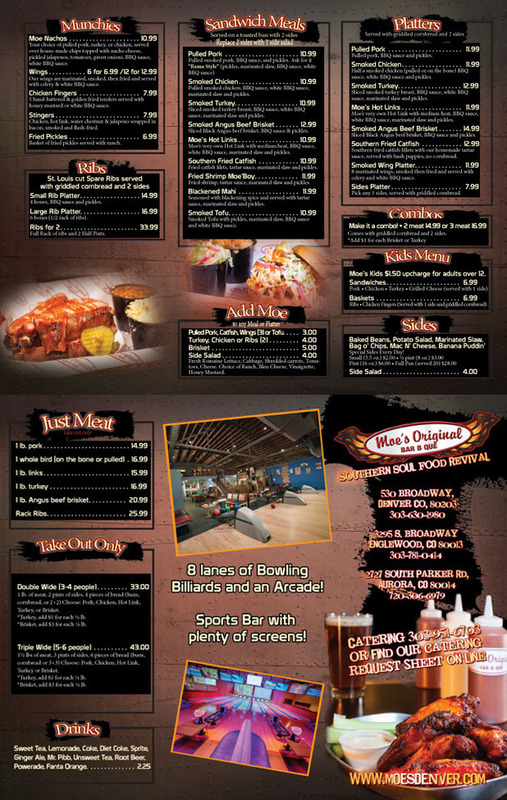 Moe’s offers an awesome, soulful and vibrant sports bar and grill experience, perfect for any get together. We serve both lunch and dinner, providing a fun, family friendly experience for everyone! On game day, watch your favorite sports on one of our many large screens, the best sports bar and grill serving up the best Alabama southern style BBQ. You can catch every play at Moe’s, a sports bar that not only dishes up amazing food, but also offers an assortment of local, seasonal, Colorado craft beers. Our Englewood location have 8 lanes of bowling, billiards tables and an arcade, so kids of all ages can have the time of their lives! Book your business party, bowling luncheon, rehearsal dinner, or birthday celebration at Moe’s for an Alabama southern style BBQ experience. Our catering services and staff are happy to help you with your menu, bowling reservations, gaming, and entertainment requests at all of our restaurant locations. And don’t forget to ask about our food truck catering services if you need us to come to you! We are happy to serve up our unbeatable best of Denver BBQ at your next event.